Coquihalla, Rogers Pass, Bear Pass, Pine Pass…are you ready? If you live on the Coast, you may not travel BC’s mountains very often. We’ve noticed a number of those living in those areas aren’t always ready to go from wet Lower Mainland winter to snowy BC Interior/ Northern winter. Sure those mountains make the perfect backdrop to all those Hollywood North movies; and of course, they’re gorgeous looking when all covered in a fresh dusting of snow. Don’t be deceived by that beauty, though. When travelling, they can change pretty dramatically when you come face to face with them. If you are planning on leaving the Lower Mainland and travelling into the mountains this winter, you need to plan ahead. 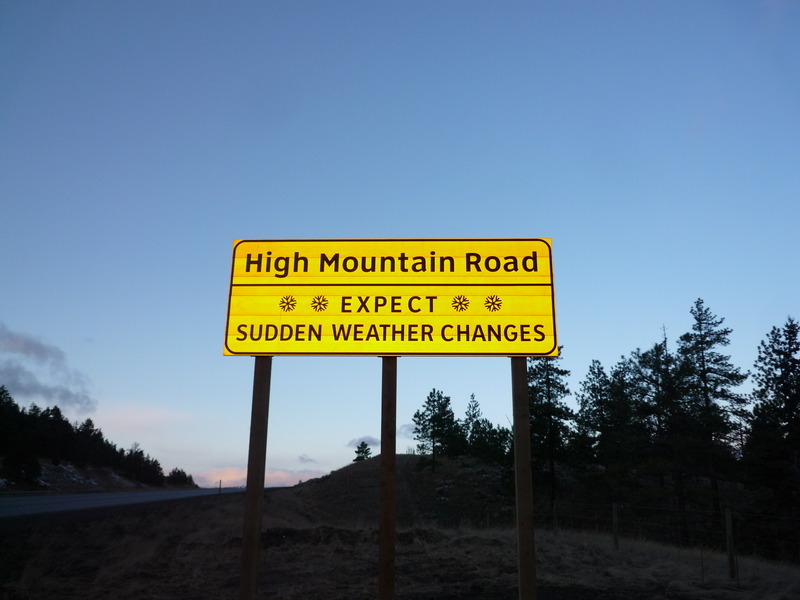 To make safety a priority, you must know as much as you can about High Mountain Passes (there are more than 50 in BC, by the way) and what they mean to you. As you could probably guess, high mountain passes are roads built on high mountains. But there’s more to those mountains than just mounds of rock. They are living, breathing environments, subject to a diverse range of weather that can change at a moment’s notice. Make sure your car has proper tires. For severe winter conditions for passes such as the Coquihalla, winter tires with the mountain snowflake logo provide the best performance. At the very least M+S tires with a tread depth of at least 3.5mm must be used. Check out our winter tire site for more information. Make sure your car has a full tank of gas. There is nothing worse than being stuck in a snowstorm because of an accident ahead and watching your last gas fumes drift away, leaving you chilling on a cold and dark mountainside. Dress the part. Pack warm clothes, boots, gloves and blankets. Keep them in your trunk. Always. Bring food and water. Seems like a simple thing, but those basic things will keep you going if the weather turns sour and you are stuck in your car. Check DriveBC. DriveBC has road conditions, events and webcams of those mountain passes, so that you can see what is happening before you go and help you decide if Uncle Bernard’s reunion is really worth the trip. Current weather from ministry Road Weather Stations and Weather Forecasts from Environment Canada (including High Elevation Travellers’ forecasts for some of the prominent mountain passes) are also available on DriveBC. Once you’re up there, be aware of road conditions and adjust your speed accordingly as things can and do change quickly. If the road is wet or has snow on it then you should be driving below the posted maximum speed limit. When conditions are anything but ideal you should be slowing down. Two of the best things about living in Vancouver are the ocean and mountains. But now that you know a little bit more about those mountains, we hope that you will take some time to prepare yourself for the high mountain road ahead. Safe travels! Let us know if you have any further questions around high mountain passes. For more information about being prepared for winter driving check out SHIFT INTO WINTER. Hello Alicia – sorry we missed this comment. We do not monitor this outside of regular business hours. DriveBC.ca is our traveller information website, with up to the moment road condition and closure information for BC Highways. Im Australian with no snow driving experience. We are tossing up driving from Vancouver to Vernon/Kelowna. Is this scenic in winter? Can we hire a car that can go over the mountains? What is the likely hood of the pass being blocked by snow? I’d value any advice & Im a total greenhorn. Hi Ant – sounds like a fun trip! While it’s hard for us to say with any certainty what the weather will be like during your visit, you should expect snow over the mountain passes between Vancouver and Kelowna. Our maintenance contractors work 24/7 to keep roads plowed, but giving yourself lots of extra time for travel is advised. Our traveller information site – DriveBC.ca is kept up to date with road condition information and our highways cams give you a look at what conditions are like at the moment. You can rent a car and drive from Vancouver to Kelowna, or you might be able to book a ride on a small bus/shuttle. Safe journey! Hi I want to travel to Revelstoke from Vancouver. I have M+S tires but I am nervous as I own a Fiat. Do you think I am equipped to drive safely? Our top pieces of advice are to take your time, check DriveBC.ca (both before you go and whenever possible on your trip) and carry chains in case you encounter severe winter weather. Be prepared to stop with warm clothes, food, water and a full tank of gas. The minimum winter tire requirement in BC is M+S with a tread depth of at least 3.5 mm. We recommend that drivers who travel snowy routes use winter rated tires (designated by the mountain and snowflake symbol). Our maintenance contractors work around the clock to keep BC highways clear, but sometimes snow can be considerable and if you feel uncomfortable driving in snowy conditions, we encourage you to wait out a storm or consider an alternate route. Again DriveBC has a map feature that can help you identify weather and road condition events to help you plan your trip. Hope that this information is helpful. Let us know if you have any other questions! My family and I will be relocating to Vancouver from Ontario, and we have to drive it. We’ll be leaving next week and probably passing through Calgary around January 13. Google is putting us on the TransCanada Highway via Banff and Kamloops, but my longer option might be south through Crowsnest pass. I’ve never driven through the Rockies before. My Toyota Matrix has winter tires. Would really appreciate some advice on routing. There are several routes you could take to get to Vancouver. They all have great scenery — welcome to beautiful BC! If you’re wanting to avoid the conditions on the Coq, Hwy 3 through the Crowsnest is a nice route. Wherever you travel through the province, you will be travelling through mountains (several different ranges). Hello! We were driving kelowna to Vancouver in the summertime, and a green beach bag flew out of the back of our truck. It was apparently after the bathrooms where the toll booths used to be. Where do I begin to try to find the bag? The bag itself is not important, but our spare jeep key and ford truck key were in there! I’m planning on travelling from Victoria to Kamloops over my winter break and I’m wondering how my vehicle will fare over the Coquihalla. It is a 90’s Toyota Tercel (front-wheel drive) with very little in the way of safety features/driver aids. I have a brand new set of mountain snow rated tires and will, of course, carry extra supplies. Do you have any advice for driving Highway 5 in snowy/icy conditions, or would you recommend I avoid it and use the Trans-Canada instead? The Coquihalla is a mountain pass and that can mean snow. Sometimes it can mean a lot of snow. But don’t worry, Our maintenance contractors are working around the clock to keep this busy and important route clear. We hope you read it but in case you don’t get a chance, here it is in a nutshell: take your time, check DriveBC.ca and carry chains in case you encounter severe winter weather. Be prepared to stop with warm clothes, food, water and a full tank of gas. Let us know if you have any other questions. Safe travels. Hello Hoyer – Our traveller information system, DriveBC.ca is your best source of information for driving conditions along your route, and we encourage you to check it before you go and whenever possible on your trip. The minimum winter tire requirement in BC is M+S with a tread depth of at least 3.5 mm. We recommend that drivers who travel snowy routes use winter rated tires (designated by the mountain and snowflake symbol). If you do choose to take BC Highway 5, we also encourage you to carry chains and know how to use them, as well as give yourself plenty of time to travel. Your trailer does not need winter tires. Our maintenance contractors on the Coquihalla work around the clock to keep it clear, but sometimes snow can be considerable and if you feel uncomfortable driving in snowy conditions, we encourage you to consider an alternate route, such as the Fraser Canyon route. Hope that this information is helpful. Let us know if you have any other questions! Thank you for the information. I was a high mountain survival instructor for the U.S Air Force in the early 1970s. I have never been to B/C. But I am getting ready for next summer. The information you have given will be useful for winter and summer. Like you said the weather can change in an instant. Sounds like you are doing your research and should be well prepared Gordon. Enjoy your trip! I am going to be traveling from Chilliwack area to Kelowna via the Coquihalla and the connector, I am not going to lie, I am more than a bit nervous. We are traveling up on October 6th and coming back on the 9th. Any idea as to what kind of weather conditions are expected during that time? Don’t fret. As long as you have good winter tires, give yourself plenty of time and check http://www.drivebc.ca before you go, you will be fine. I am planning to drive from Calgary to Kelowna on Wednesday. With the early show fall on Rogers Pass today and Tuesday, wonder how fast the snow removal crew will be able to clear the highway? And is it safe to travel on that section of Highway #1? Good morning Jason – it looks like Rogers Pass is set to get a significant amount of snow throughout the day today 5-10 cm). Parks Canada is responsible for road maintenance through the sections of federal park and our maintenance contractors patrol provincial highways 24/7 to make sure they are cleared. Sometimes, snow can accumulate between rounds of our plows, so we encourage you to travel slowly, be prepared if you have to stop unexpectedly and don’t forget to check our traveller information system, DriveBC.ca for road condition updates, webcam views of your route and weather info. We hope that this helps. Safe travels. This is a great website, with solid advice, and a little humour (bonus). We travel monthly from the lower mainland, into the Shuswap region, and knowing what to be mindful of to stay safe at varying times of year is super helpful. Thanks so much for keeping this current! Awe shucks – thanks Paulina! We LOVE to hear that. It’s why we do what we do. Thanks so much for letting us know – safe travels! I’m working in Anchorage An and purchased a Jeep wrangler unlimited sport that I need to drive to Seattle in November. Is this vehicle capable of making this trip at that time of year. As long as your Jeep has M+S or winter tires (with a mountain and snowflake symbol) and at least 3.5 mm tread depth, you should be good to go. Please remember to check DriveBC.ca for up to the minute travel information before you go and on your journey when possible. Safe travels! i will be traveling from edmonton, calgary, banff and then to revelstoke in mid august 2018, i will also be pulling a 26 foot travel trailer with my 2012 f150 ecoboost, fist time driving this route, is there any info that you would suggest to make my trip as safe as possible, driving conditions, roads etc. Our other advice is to give yourself plenty of time and to plan your route by using our traveller information tool, DriveBC.ca. Safe travels! Some advice about typical conditions along the Coquihalla would be greatly appreciated. I understand these conditions can change quickly. I am just trying to plan out my flight to Victoria at an appropriate time of year. I hope your ideas are helpful about this. Thanks for the sharing such a helpful article with lots of information. Thanks for asking about travel on the Coquihalla Highway. The Coquihalla is a high-elevation route, and thus it is prone to unpredictable weather. Another excellent resource is DriveBC.ca which will show you all the road conditions and weather along your route, including webcam views. I am picking up a new sports car in Victoria and driving it home, to Alberta, in mid-April. It is a RWD vehicle and since I am flying in, I don’t plan to have winter tires installed. Is the Hwy 5 route typically clear by Mid April? Should I plan for a later trip? or an alternate route? I am an experienced winter driver, commuting 100KM round trip on QE2 each day in some of the worst weather. However, my daily truck has 4×4, weight and winter tires. Some advice about typical conditions along the Coquihalla would be greatly appreciated. I understand these conditions can change quickly. I am just trying to plan out my flight to Victoria at an appropriate time of year, the sooner the better so the dealership doesn’t charge storage fees. So I’m planning to drive through the rockies in March, if I have all season tires on my car with a minimum of 3.5mm thread, am I good to go? As long as your tires are rated M+S as well, yes. Please also remember to check DriveBC.ca and give yourself plenty of extra time to travel! I’m planning to drive from Vancouver to Toronto the last week of February. Is that a terrible time to drive? Or do you think the snowy weather would be gone by then? Winter driving regulations are in effect on most BC Highways until the end of March (even later in more northern regions). Travellers through mountain passes in BC should expect poor weather conditions at any time of year (yes, even snow). We can’t say for sure what the weather will be like across Canada at that time, but assume that winter will still be holding a strong grip in most places. We encourage you to check weather forecasts closer to your departure time and plan your route accordingly. Give yourself plenty of time, carry chains, warm clothes and extra food and water in your car in case you are stopped in an emergency. Our traveller information system, DriveBC.ca will give you up to the moment road condition information and we suggest you check similar sites for the other provinces as well. We hope that this helps. Happy and safe travels. We can’t say for sure what the weather will be like in the Rockies during June. High mountain passes can see snow any time of year – so it is best to plan accordingly. You should let the rental agency know where you will be travelling and that you would like a car with snow tires (and chains if possible). Our biggest advice is to familiarize yourself with our travellers information system drivebc.ca. The site includes up to the minute road condition information, closures, events and maps to help you plan your trip. Give yourself plenty of time to travel and enjoy! I will be pulling a “car transporter” trailer with a small SUV on it, using a loaded rental 5 ton dually truck. I will be travelling from Delta BC to Lethbridge AB on Feb 01 2018. I plan to carry cable chains for the outside dually tires, and cable chains for the rear axle of the two-axle car trailer. My route is flexible, so I am wondering which route is most suitable, gradient and weather-wise, for the trip ? Also, I am not familiar with ‘chain-up’ areas on the cross-mountain routes, so any information on that aspect of the recommended route would be appreciated. There are signed pullouts along these routes ahead of steep grade areas where you can pull over to chain up should the weather necessitate it. Hope that this helps! Any advice is greatly needed…a new Coquihalla traveler to be… and yes I am prepared otherwise (food, blankets, shovel, phone etc…). Here are the actual dimensions of the tire…. LT285/75R17 and I believe the mm depth is approximately 10mm or just there under…the tires have about 20kms on them thus far. Thanks for your question and for connecting with us here. Reducing tire inflation is never a good idea. A vehicles tires are designed for the vehicles load carrying ability and the vehicles responsiveness when driving day to day. Under-inflated tires cause tire damage and heating of the tire. The reduction of tire air pressure as a tool generally comes from those who reduce tire pressure to increase their footprint so as to spread the vehicles surface ground pressure so the psi load per tire is reduced . Those who do it are doing so in low speed applications such as when driving on “Tundra” (deep snow covered areas where no roads exist) or on roads that are close to spring break-up with “frost” coming out of the ground (tractor trailer trucks such as logging trucks with centralized tire inflation systems so as to deflate and inflate tires as conditions warrant). On BC highways, snow conditions are seldom encountered on a regular basis, therefore properly inflated winter tires with the M+S symbol and 3.5 mm of tread depth is the best option. We always recommend drivers carry chains they are planning on travelling severe winter weather routes on a regular basis. Giving yourself plenty of time so that you don’t have to rush and remembering to check our traveller information site, DriveBC for road condition information and webcam views is another great step to take before you leave on your trip. Hope that this information helps. Safe travels! Hi there. Is a 4 wheel drive enough in terms of requirements to drive on the Coquihalla? No. 4 wheel drive is not enough to meet requirements to drive on the Coquihalla. Winter tires with either the mountain snowflake symbol or the M+S logo and a minimum tread depth of 3.5 mm are required. We also encourage you to carry chains for your vehicle, and know how to install them. My girlfriend and I are planning to drive from Vancouver to Vernon for the holidays. I have a new Honda Civic with all season tires, and I also recently purchase a set of chains from Canadian Tire. If we put the chains on the all-season tires, is that good enough for going through the Coquihalla ? Also are two chains on the two front tires enough or are we required to chain all four tires ? Wonderful of you to take people’s questions. Thank you! We have winter tires and am planning a trip from Vancouver to Kelowna over Christmas. The fear around a few cm snowfall being a storm (I am from northern Alberta) has me worried and wondering if I need chains for the Coquihala. I have done this drive before without chains and winter tires were fine. Are chains required if I have snow tires? Being prepared and taking your time are two of the best things you can do to prevent worrying. Check DriveBC before you go so you can see what the conditions are like before you go. Because winter road conditions across most of B.C. often include snow and ice, we recommend drivers install mountain/snowflake tires for cold weather driving and, for extreme conditions, carry chains. If conditions present themselves that require chains to be used, you can put them on at that time, but if you have a good set of winter tires (with the mountain and snowflake logo), you should be fine in your travels. Hello, I read your forum to find the answer about having winter tires on a camper trailer towed with a hitch not an in truck bed hookup. I could not find an answer. However this is my question, I will be driving a GMC diesel 3/4 ton truck, towing a 37 foot camper trailer with a hitch connection from the prairies to langly BC January 1st. While my diesel truck has the mandatory rated tires for driving through BC, and specifically I will be going through the coquihalla pass with my truck and camper. But does my camper which is a very large camper 37 ft. Do my tires on the camper have to be rated with the ms or snowflake logo also? Do I need tires on my camper also rated or is my truck with the rated tires sufficient? And if the camper tires do not need to be the same winter ratings as my truck? Do I also need to carry chains for my campers tires? It also has 2 axles, 4 tires, do I also need all 4 tires chained if I do have to put chains on my camper? And I am assuming if I do have to have all 4 tires on the camper rated tires, then I do not need chains for them? I’m very confused, I have read numerous posts on numerous sites, and I cannot find any info on rated required tires for towed camper/trailers? Can you Please help me? The minimum legal requirement for recreational vehicles is to use M+S rated tires of 3.5 mm minimum tread depth. A minimum of two winter tires would be required to be placed on the two primary drive wheels of the vehicle. We always recommends that 4 winter rated tires be used, and that drivers should carry chains where severe winter weather can be encountered. We also recommend that for those that pull a trailer, that the motorist pulling the trailer consider a single set of chains for use on one tire of the trailer. The trailer chain, when used on one tire of the trailer during snow and ice conditions minimizes the chance that a trailer will “jack-knife” when a vehicle is pulling the trailer at a slow speed while traversing a “super-elevated” curve that is snow and ice covered. We hope that this helps. Are chains required during summer months July and August. Road tripping from Ontario next summer. Carrying chains year round is always a good idea, especially on high mountain passes in BC. While it likely that the weather will be beautiful, being prepared for any kind of weather is always your best bet. Have a great trip and don’t forget to use our traveller information site DriveBC. Hi there! It would be super helpful to show a map rather than a list of mountain passes. For travellers, googling where all 50 are one by one is not super helpful. Updating while “thinking like a tourist” would make this an awesome resource! A great suggestion – thank you. We have shared it forward. Weather in BC, especially on high mountain passes can change quickly, so you should be prepared for any kind of weather, so please remember to check DriveBC for current road conditions before you go and give yourself extra time, so you aren’t rushing. Will be travelling from Edmonton to Victoria and back the last week of July. What’s the Coq like that time of year? Concern about steep climb northbound, but the car is less than a year old and in great shape. The Coquihalla is a high mountain pass and subject to inclement weather at any time of the year. July and August are typically better months for weather along the route but traffic will be busier than normal at this time. Check our traveller information site DriveBC before you go and as you travel for up to the minute information on BC Highway 5 and any other routes you are taking along your trip to the island. Safe travels! My wife and I are about to set off on our Canada road trip from Ontario to BC. Our car has had a great tune up and has good all season tires on it. Do we need winter tires? How are the road conditions right now? Any advice would be appreciated. We are doing strictly Canada driving on the TCH on to BC. And should I buy chains? Have a 2003 Manual Honda civic, where do I buy chains? Hello! Thanks for connecting with us here – sounds like you have a great trip planned. We are glad to hear that your car has good all seasons on it and we recommend that you carry chains for the high mountain passes in BC just in case. Weather at higher elevations can change very quickly and being prepared is the best thing you can do. You should be able to find the right chains for your car at Canadian Tire or any other automotive store. Winter tires are recommended but not necessary if your tires have the M+S logo on the side and at least 3.5 mm of tread depth. Here is a link to our winter tire website: http://www2.gov.bc.ca/gov/content/transportation/driving-and-cycling/traveller-information/seasonal/winter-driving/winter-tires-and-chains which we think you will find useful. We can’t say what the weather will look like when you arrive in BC but we can advise you to check DriveBC, our traveller information website often on your travels here. You can plan your route, check for traffic incidents, see weather along your route and view the route with our BC HighwayCams. Hope that this all helps and if you have any other questions, let us know. Safe travels. Hi I am planning to drive to summerland from Squamish to pick up some motocycles I will be hauling an empty trailer one way and 1000 pounds of Harley’s I was planning to use my 1981 rabbit pick up truck . It’s front wheel drive with ,4 brand new snow tires.. Would I need chains for the trailer? It depends on when you’re travelling and what the weather conditions are. From Oct 1st to March 31st, vehicles must carry tire chains. Wondering what the maximum size of sand is used in BC as I find the East Koornay Region is using small rocks in their mix. I have been driving for 30+ years all across Canada and have never seen pebbles on the road. As a result I have also received numerous window and paint chips on my vehicles as a result as have most motorists living in the Elk Valley. Who is tesponsible fir these repairs? Hope that this information helps. I have studded tires for my all wheel drive ford freestyle, as well as one set of chains. Should I buy another set of chains since my car is all wheel drive? Do you suggest that I actually drive with the chains on if I’m going through the Coqhihalla this weekend? Hi again Valerie. We talked to our traffic safety engineers about your question of chaining up all-wheel drive vehicles. You’ll need to know how the drivetrain operates. In general, for passenger cars, we always recommend a minimum of four winter tires for traction and lateral stability. When seeking to enhance “traction” by the means of chains, we always recommend a minimum of two be added to the primary drive axles of the vehicle, which for front wheel drive cars is the front axles, and for rear wheel drive vehicles, the rear axle. All-wheel drive vehicles will be different. Under normal driving conditions for many all-wheel drive vehicles there is a 60% to 40% split between the power going to the front as compared to the power going to the rear. In this case, when deciding to chain-up, you’d want to switch to equal amount of power to each wheel on all four corners of the vehicle. To do this, you’d activate the full time 4-wheel drive feature. Then put chains on front axle of the vehicle in order to take advantage of the weight of the engine over the front axle, which will provide enhanced traction. You can also simply chain up all four tires. Are chains required or recommended for travelling Rogers Pass in December? We are driving from Calgary to Kelowna and although I have winter tires I want to be prepared if its recommended to have chains as well. I grew up in NW Ontario and remember chaining up well. I drive a Toyota Sienna so definitely not a 4×4! We strongly recommend travellers carry chains in addition to their winter tires while travelling mountain passes in BC. Our other advice is to check conditions on your planned route via DriveBC, our traveller information system. Safe and happy travels! Sadly drivers can’t be trusted to prepare or drive to conditions – especially some of the so-called ‘professional’ drivers working in the trucking industry. I am starting to believe that it is time that precautionary road closures need to be considered when big storms are forecast. I have worked on far too many road closures that have happened after the fatalities or life changing injuries. They are getting so predictable that wouldn’t it be better to close the road before they happen. Our vehicle has all season tires. Someone said we could be fined travelling the Coquilla without winter or M&s tires? The trip is this weekend. In order to travel over the Coquihalla this weekend, you will need either winter rated or M+S tires. The majority of all season tires are M+S rated. Here is a blog with more information about types of tires and winter driving, hope it helps! Are known to be treacherous at best during the winter months. I was trained to drive on the logging roads of the Comox Valley, and have transmitted the TC1 through the summer many times. I have a 4×4 with good mud&snow tires, and will be hauling a utility trailer with me. Any advice would be welcome. I am a survival equipment specialist in the RCAF by trade, so survival equipment and extra gas is without question. Thank you for connecting with us here. We were glad to hear that you will be travelling your chosen route well prepared. To be clear, safety of the travelling public on British Columbia highways is our absolute top priority and the Trans Canada between Golden and Revelstoke is no exception. Our maintenance contractors work very hard to ensure that all of our highways are safe for travel. Our traveller information system, DriveBC is a great source of information for travellers in BC and we encourage you to check the site before you leave and if possible during your travels so that you will be aware of the conditions that lie ahead. Using proper winter tires is also highly recommended on most highways in BC between October 1 and March 31. Our last recommendation is to make sure that you give yourself lots of time, so that you don’t need to rush. But it sounds like you are one highly prepared fellow and we think you will be ready for anything – especially a beautiful road trip through fabulous BC! Hope that this helps. What is the weather like on the Coquihalla in the summer? While weather on the Coquihalla during the summer is typically fair – summer storms can bring rain and even snow to high elevations. The tips given in this blog are valuable during the summer and winter and as always, please remember to check DriveBC for up to the minute road conditions and events. Not sure if anyone mentioned it and I might of overlooked it but getting a BCAA premium card might pay off too. Check all fluids, thermostat, belts, hoses, alternator, battery and put a piece of cardboard in front of your grill or radiator if it’s too cold for your car engine to stay warm. Interesting site for people unused to winter driving. I’d sure love to see the words “SLOW DOWN” written somewhere in capitals. I know it’s mentioned above but in such a pleasant way I wonder if it will register. So many people do not know black ice is hard to see but very easy to lose control on and don’t seem to even know enough to check it out. Bare & wet can often be icy. Why not add a winter speed LIMIT when conditions are treacherous? 120, 110 and even 100 k/p/h are too fast much of the time and especially at night. We agree that this is common sense, but unfortunately we have found that not everyone carries their common sense with them, let alone a shovel and blanket. We have written many other preparedness blogs which we hope you will find more useful. Thanks for the comment. As one of our Avalanche techs, I know this topic is top of mind for you. Of course we always think of the North. The intent of this blog is to make sure those travelling from the Lower Mainland and the Island are aware of the changing weather and driving conditions in the Interior and the North. We’ll look to add your suggestions to our list as well. Did you take part in this one? Under Point #6 “Check DriveBC”, you forgot to mention that current weather from Ministry Road Weather Stations and Weather Forecasts from Environment Canada (including High Elevation Travellers’ forecasts for some of the prominent mountain passes) are also available on DriveBC. Thanks Simon – we have updated the blog to include this! How about Gnat Pass, Ningunsaw Pass, Bear Pass? All of these are snowbelts and higher in elevation. Good call Steve – thanks! 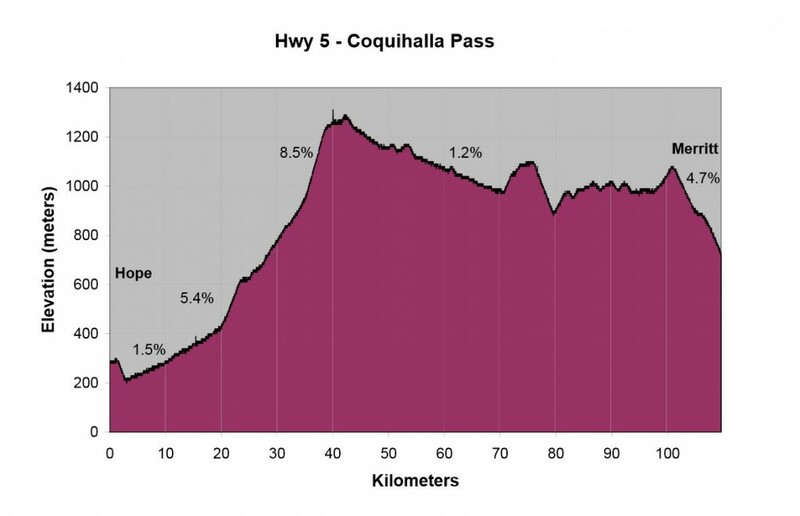 The elevation graph depicting the extreme rise experienced on the Coquihalla is an excellent tool to get the message across that it truly is a high mountain pass. Awesome! We think so too Lynn! Thanks for connecting with us.